Cross Rigid – LEGG Company, Inc. Applications with sharp turns or heavy cleats require a cross rigid belt which remains flexible enough in the warp direction to handle the pully wrap. Our cross rigid belts are manufactured in accordance with superior quality standards making them extremely durable. 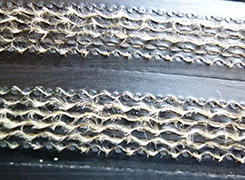 Monofilament polyester yarns stabilize it both in the fill and weft direction. It uses LEGG's proven Legend Polyester/Nylon S&Z Twist tension carcass.